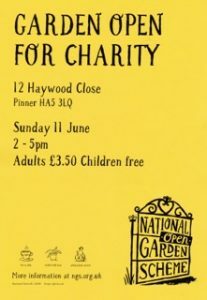 Do you like plants, gardens or gardening, then why not spend some time wandering around our garden knowing that all proceeds will go to good causes. Our garden at 12 Haywood Close, Pinner, HA5 3LQ will be open on Sunday 11th June between 2 to 5 pm. We moved into the property less than 4 years ago. From a reasonably blank canvass, we have developed the garden to its current state. Herbaceous perennial borders surround an oval lawn. The garden contains over 50 varieties of roses and clematis, a rose walk, gazebo, sink garden, pleached hornbeam trees with box collars and a small vegetable & fruit garden. There are seating areas to rest and relax. The enthusiastic, plantaholic owners have grown many of the annuals and perennials from seeds and cuttings. There is always more to be done and areas to mature; A garden is a journey, not just a destination. Entry is £3.50 for adults and free for children. There will be teas, cakes and plants for sale.